Hawaii medical assistants are given a high degree of flexibility in their work. Because the Hawaii legislature has not formally set forth a scope of practice, physicians and nurses have some freedom to delegate to unlicensed personnel as they see fit, within certain licensing guidelines. Medical assistants in Hawaii also enjoy a higher wage than the national average, as the wages in Hawaii are among some of the highest in the nation. Read more about what is required of medical students in Hawaii along with training programs available, employment trends and certifications. Health care is a rewarding field, allowing professionals to affect the lives of many. Working in medical assisting is one way to get started in the field, starting with a certificate or degree from a Hawaii college. Medical assistants can go to work in a health care facility or physician’s office helping to manage patient caseloads and scheduling. But first, you need to find a quality program that works for you and your schedule. 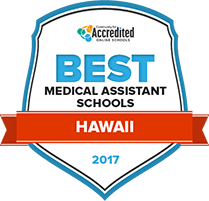 We’ve done some research and found the Best College for Medical Assisting in Hawaii for the 2017 school year. The associate in science degree with an emphasis in medical assisting offered at Kapiolani Community College may help students achieve entry-level job placement, or continue their education in a bachelor’s program at a different four-year school. Students will learn administrative skills common to health clinics, doctor’s offices, and hospitals, making them an idea addition to any medical team. Students can reinforce their learning by attending one-on-one tutoring sessions with staff members specially trained in their academic field. Students may also join one of Kapiolani Community College’s special interest clubs to socialize with likeminded peers. When seeking a medical assistant school, it is vitally important that the school or program be accredited. The following spotlight school offers a good example of what students can expect from their education on the way to becoming a medical assistant. Located in Honolulu, this school provides students with two programs to become a medical assistant. Upon graduation, students are fully prepared to sit for the Certified Medical Assistant exam. The medical assisting certificate is designed to be completed in 48 weeks and requires 33 credits, while the associate degree in medical assisting takes about twice as long. It is comprised of 64 credits. How does Hawaii define "medical assistant"? Hawaii does not offer a standard definition of medical assistant - however, it is implicitly understood that medical assistants are unlicensed assistive personnel, and that they can be delegated certain tasks under the supervision of a physician or nurse. Is certification required and available? Formal education or training is not required in order to become a medical assistant in Hawaii. However, many employers prefer to hire those who have undergone some sort of formal training program. Further, those who attend a formal training program from an approved school and fulfill all requirements of the program are eligible to become certified by a national certifying body. Are there tasks outside the scope of medical assistants in Hawaii? Hawaii does not set forth a scope of practice for medical assistants; however, the rules for what nurses and physicians can delegate are made very clear. According to Hawaii statutes, knowingly permitting an unlicensed person to perform activities requiring a license can lead to revocation, limitation or suspension of a license to practice medicine. For instance, a physician who allows a medical assistant to write a prescription is taking an enormous risk in potentially losing their license. Therefore, nurses and physicians tend to only delegate tasks such as taking vital signs, drawing blood and the like. What medical assistants make varies widely depending upon a variety of factors, such as experience, certification and specialties. However, it also varies depending upon the geographical area. The following chart offers information on what medical assistants make in Honolulu, as compared to other areas of the island chain. The growing need for medical assistants is universal around the country, but some areas are expected to see faster growth than others. The specific need for medical assistants in Hawaii from 2012 to 2022 can be found in the following table. The AAMA is one of the leading medical assisting organizations, administering the Certified Medical Assistant (CMA) exam. In addition to administering the Registered Medical Assistant (RMA) certification, the AMT also supports local chapters to help medical assistants advance their professional career. The Hawaii statutes governing medical professionals allow certain medical tasks to be delegated to unlicensed medical professionals, such as medical assistants. Supported by the AMT, the Hawaii State Society hosts meetings and events for medical professionals such as medical assistants.